PARIS --- The firing of the executive appointed by Airbus to fix the troubled A400M program after just 12 months in the job illustrates the program’s continuing production problems, which could lead the company to take new financial charges for 2015. The firing of Ms. Pilar Albiac-Murillo, who was appointed on Jan. 29, 2015 and given “responsibility for all industrial-related activities [which are] being shifted to the Operations organisation,” was announced internally to Airbus managers but has not yet been made public, according to the Spanish daily El Confidencial, quoting trade union sources. “We can’t comment,” an Airbus DS spokesperson said in a Feb 18 e-mail. Leaking news of the firing this week ensures that the A400M program, and more broadly the situation at the Spain-based Military Aircraft division, will take center stage when Airbus Group announces its 2015 financial results on Feb. 24 in London. Albiac’s dismissal is due to "problems in the ratio of on-time deliveries, and time and quality” problems in the A400M program which she was appointed to fix, according to El Confidencial, which says it has seen the internal e-mail. No other management changes have been reported, and Fernando Alonso, who also was appointed Head of its Military Aircraft business unit and CEO of Airbus Spain in January 2015, remains in place. In fact, it was Alonso who, a few months ago, gave Albiac an ultimatum, El Confidencial reported quoting trade union sources: meet expectations or face the consequences. While Albiac was appointed to get deliveries back on schedule, her firing less than a year later may seem disproportionate, given that Airbus missed its 2015 delivery target by a small margin, and that flight operations were suspended for several months after an aircraft crashed May 9. It is possible that other factors also came into play, however. “In 2015, we delivered 11 aircraft plus 4 aircraft ready for delivery [which] were put into the DASS conversion for the UK. ‎Of those four, two have been delivered to UK already in early February,” the Airbus DS spokesperson said. Airbus had promised it would deliver 14 to 16 aircraft in 2015. The delivery schedule was impacted by the May 9 crash of an A400M at take-off, which led Spain to ground the aircraft, and which was later found to have been caused by faulty assembly of an engine component. Four people died in the crash. The A400M continues to suffer from problems with its TP-400 turboshaft engines as well as other technical failures which, according to trade union officials, are destabilizing the entire chain of command, so further organizational and management changes cannot be ruled out. In the financial statement for the first 9 months of 2015, issued Oct. 30, Airbus Group said that “Management reviewed the programme evolution driven to a large extent from the implications of the accident, the impact of low inflation on the price revision formula, delays in military functionality and challenges in the industrial ramp-up, together with associated mitigation actions.” Airbus Defence and Space recorded an additional net charge of 290 million euros for the A400M program in the second quarter of 2015. There was no warning that problems were getting worse, however, apart from the fact that deliveries continued to lag. The ramp-up is proving difficult, with eight A400Ms delivered in 2014 and 11 in 2015 – but only 5 during the first 9 months. The first two aircraft were delivered in 2013. The crux of the problem is that Airbus cannot meet contractual delivery dates, and those aircraft that it does deliver are not fully operational and do not meet contractual standards. The situation is so dire, and customers so incensed, that Germany levied a 300 million euro fine on Airbus last year for failing to meet its contractual obligations. Albiac’s firing is likely to cause concern at the Airbus plants in Seville, where the A400M and C295 light turboprop transport are assembled, and at Getafe, near Madrid, which converts Airbus 330s into Multi-Role Tanker Transport (MRTT) aircraft, both of which are successful on the international market. Airbus managers in Spain fear that corporate headquarters in Germany is taking over direct control of these programs, and frictions continue between Spanish production sites and senior management in Germany. Apparently, the fix is not imminent, although it has been promised several times to little effect. It is likely that Airbus Group will announce new measures on Feb 24, and a new charge on the A400M program cannot be ruled out. Over the life of the A400M program, Airbus has taken 4.2 billion euros of financial charges, while partner governments added 3.5 billion euros in additional financing. 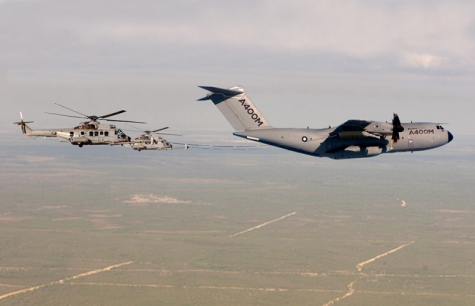 The cost of the A400M’s development and production program is estimated at 20-billion-euros.